Wed., April 6, 2016, 11:13 p.m. He had played hockey his whole life, including the previous 19 years at the professional level. But when he arrived in Spokane in the fall of 1971 at the age of 39, Norm Johnson was a rookie. And, oh, what a rookie season it was. In his first coaching venture, Johnson guided the Spokane Jets to the Allan Cup, the symbol of the Canadian senior amateur championship. The native of Moose Jaw, Saskatchewan, who spent one more season in Spokane before moving on, died March 22 in his adopted hometown of Portland. He was 83. “He was a mild-mannered coach; not a yeller,” remembers Don Scherza, who played on what was known as the “Flea Line” in those days. Spokane had become the first American city to win the Allan Cup two years previous under much-honored former NHL goalie Al Rollins. When Rollins left after three seasons to coach Salt Lake City in the minor professional Western Hockey League, a replacement was needed. Welcome to Spokane Norm Johnson, freshly retired from the Portland Buckaroos of the WHL. Oh, by the way, did we mention you have some big shoes to fill? Johnson had name recognition as a player, none as a coach. Although he played just two seasons in the NHL, he was a scoring star in the WHL. It was at Portland, where he played the last four seasons of his career, that Johnson learned the “system,” as Scherza called it, that served the Jets well. Scherza said you couldn’t tell Johnson was a first-year coach. “He was a good, steady coach,” said Scherza. “Our first Allan Cup (in 1970) we were younger, played with a lot of energy. In ’72, we had more talent, more experienced players. He just fit in. He was a heck of a hockey player and could have played with us. “Some of the guys have said he was probably our best coach,” Scherza added. In two seasons in Spokane, Johnson compiled a 92-35-3 record, including playoffs. In the 1972-73 season, the Jets made it to the Western Canada senior championships, the Patton Cup, losing to St. Boniface, Manitoba, in seven games. 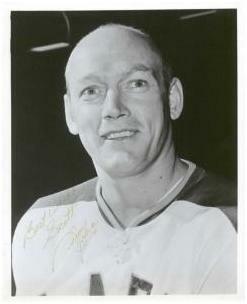 Johnson had two more brief coaching stints, with junior teams in Brandon, Manitoba, and North Battleford, Saskatchewan, before retiring to Portland, where he became a successful developer. He is survived by his wife of nearly 59 years, Doreen; sons Shane and Jay, and daughter Kella Horton, their spouses, and nine grandchildren. A celebration of life is planned for Sunday at 1 p.m. at Columbia Edgewater Country Club in Portland, where Johnson had been a member for more than 30 years. Published: April 6, 2016, 11:13 p.m.